For those of you who suffer from Gephyrophobia--fear of crossing bridges--the Reber Plan would have ameliorated your condition. If the name Reber doesn’t sound familiar, may we suggest a ferry ride to Sausalito? We would have been looking at a very different Bay if theatre producer and improbably self-taught engineer John Reber had gotten his way: 20,000 acres of former mudflats given over to industrial development; two great barriers to keep the salt water of the Pacific from contaminating valuable fresh water for both Southern and Northern California; a lock system equivalent to that of the Panama Canal; and ruin for one of the most complex ecosystems in the world. Watery discourse is unavoidable when discussing San Francisco’s history, such that we’ve hinted at it in no fewer than three previous columns. To do the topic full justice, find a copy of the documentary Saving the Bay, oft-screened on PBS and available at your local public library. But even better, you can live the drama of the watershed at the U.S. Army Corps of Engineers Bay Model, currently in dry dock but still utterly riveting in an I-can’t-believe-they-really-built-this-way. Oh yes, they did. Constructed between 1956 and 1957 at a cost of $400,000, the Army Corps of Engineers built the 1:1000 (horizontal) 1:100 (vertical) scale model encompassing about an acre. Time is sped up by a hundred times such that 14.9 minutes represents a day’s tidal cycle; a computer-operated pump stands in for tidal force. 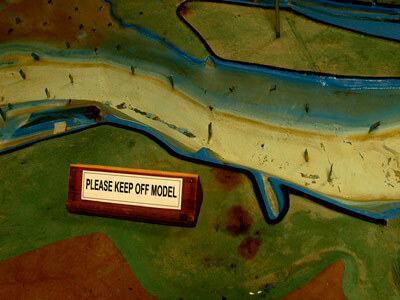 The model was the only true way to determine the impact of significant alterations to the estuary, and the November 1957 issue of Popular Mechanics surmised that it was "the most valuable piece of concrete in all the world.” And so it was, until the advent of testing of a more modest, computerized scale. The model was technically decommissioned in 2000 but fortuitously not dismantled. According to Senior Ranger Bill Cope, about 150,000 people visit the model each year, and barring any unforeseen complications, its tiny tide should roll again by the end of September. Some much needed infrastructural repairs are underway thanks to the American Recovery and Reinvestment Act, and the installation of 2700 solar panels will bring the operation up to green initiatives. In its dry state, parts of the model resemble nothing so much as a mini golf course. Although the folks working on the model were friendly, we doubt they’d take kindly to an offer of such sport. A short 20 minute walk from the Sausalito ferry landing, the Bay Model is free, but donations are welcome. The Tenderloin Geographic Society is San Francisco's home for colloquial cartography and citizenship services since 2006. Stay tuned for the Tenderloin Report. If you've missed any episodes, you can always catch up here. "Together Forever" by Darwin Bell.